Just Host formerly known as Super Green Hosting has been one of WPBeginner’s original partners. They have outstanding technical support and extremely reliable servers. They have a special deal for WPBeginner users which makes them the most affordable hosting company among all providers. Not to mention, they are also offering free domain for life with every new account. Just Host is a great choice for small business owners and individuals needing quality, flexible WordPress hosting on a tight budget. They offer shared hosting, VPS hosting, and dedicated server hosting. See our expert Just Host review to decide if it’s the right choice for you. Just Host was founded in 2008 by serial entrepreneur Chris Phillips, and is one of the most recognizable names in web hosting today. They pride themselves on offering fully featured web hosting for individuals and small businesses, backed by 24/7 technical support. Just Host offers all the features you need to create an effective web presence. Just Host specializes in shared hosting for individuals and small businesses. They offer four levels of shared hosting: Basic, Plus, Prime, and Pro. All shared hosting plans include 1 free domain registration, and unmetered bandwidth. The plans differ based on the amount of storage space, websites, and email accounts included. The Prime plan is unlimited. The higher tier plans also include extras such as advertising credits, automatic site backups, and spam protection. The Pro shared hosting plan promises better performance with reduced server load, plus a dedicated IP address and SSL certificate. This is ideal for keeping your eCommerce site reliable and secure, and reassuring your customers that their information will be kept safe. Just Host also offers affordable options for VPS hosting and dedicated server hosting plans. When your site grows beyond shared hosting, you can stay with Just Host and upgrade your account. All VPS and dedicated server plans are instantly provisioned so you can upgrade immediately. They also offer managed hosting services so you can get more hosting power without stressing about the technical details. In our Just Host review, we found that Just Host provides comprehensive web hosting for bloggers and small businesses. They offer all you need to create your first WordPress website. Just Host provides technical support 24/7 via phone, live chat, and email. We reviewed Just Host’s support options and found that they responded very quickly to inquiries. Just Host also maintains a Help Center on their website. It contains answers to frequently asked questions, and plenty of tutorials to walk you through the process of setting up your website. 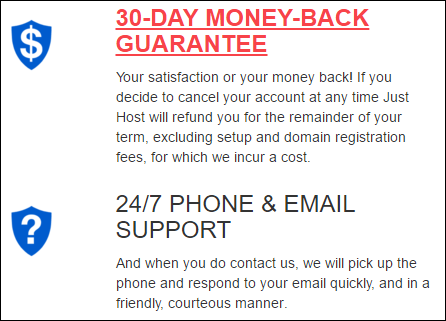 Just Host has a 30 day money back guarantee. That means that if you cancel your account within the first 30 days of signing up, you can get a full refund of all hosting fees. If you registered a domain through Just Host, the domain is yours to keep and is not included in the refund. After the first 30 days, you can still cancel your account at any time. You’ll receive a prorated refund for any remaining time you did not use. Many hosts don’t offer prorated refunds if you pay ahead. Just Host is a popular web hosting company for bloggers and small businesses, but it may not be right for everyone. Consider the following pros and cons before you choose a plan. Affordable – Just Host provides everything you need to build an effective website even on a smaller budget. Monthly Billing With No Setup Fee – You can choose to pay on a month-to-month basis if you prefer, although you’ll get a bigger discount if you choose a longer billing term. There’s no setup fee for monthly billing. Beginner Friendly – Just Host specializes in providing hosting for individuals and small businesses, not tech experts. Their aim is to make hosting your website as simple as possible. 24/7 Support – Technical support is available via phone, email, and live chat at any hour, day or night. Upselling – Just Host offers a wide range of addon services with their hosting, including Search Engine Jumpstart, SiteLock Security, and Site Backup Pro. Some users may find the upselling to be too aggressive. If you don’t need these services, be sure to uncheck them when creating your account. Mixed Reviews – Like most large hosting companies, Just Host has both good and bad reviews. Most customers will only leave a review if they have an extremely positive or extremely negative experience, so it’s normal to get mixed reviews. In our review of Just Host, we found them to be reliable and affordable. Is Just Host Right for You? Now that you have read through our entire Just Host review, you might be wondering whether Just Host is the right web host for you. If you’re looking to start your first WordPress website, whether for yourself or for a business, Just Host is an excellent choice. With their 1-click installation tool, they make it fast and easy to create a WordPress site. Their hosting is reliable and has all the features you need, and their fast and helpful customer service will help you out 24/7 if you have trouble. Ready to get started with Just Host? Click here to select your Just Host plan today. WPBeginner users get over 50% off their regular price as well as a free domain for life with our Just Host coupon code. All you have to do is click on this link to purchase. The discount will be auto-applied. I am using Justhost hosting since 2015. I really like this web hosting because they fulfilled all my requirements and unlimited space in very cheap price. Customer support is very good 24/7 they support. I am really happy. I have used Justhost hosting since the end of June of this year and have called technical support many times and they have helped me even when it was something with my theme. In my experience they are simply the best.